Select Credits: Ken Urban's Nibbler (Stable Cable - directed by Stephen Brackett); Kristoffer Diaz's Julia & Eric (Rattlestick Theaterjam Festival); Kim Davies' The Love of Richard Nixon; Emily Daly's Barter (Stable Cable/Redrum Theater in DC). Why theater: Because the people are smart, crazy and fun, and they don’t judge you for having a therapist. Who do you play in Live From the Surface of the Moon? 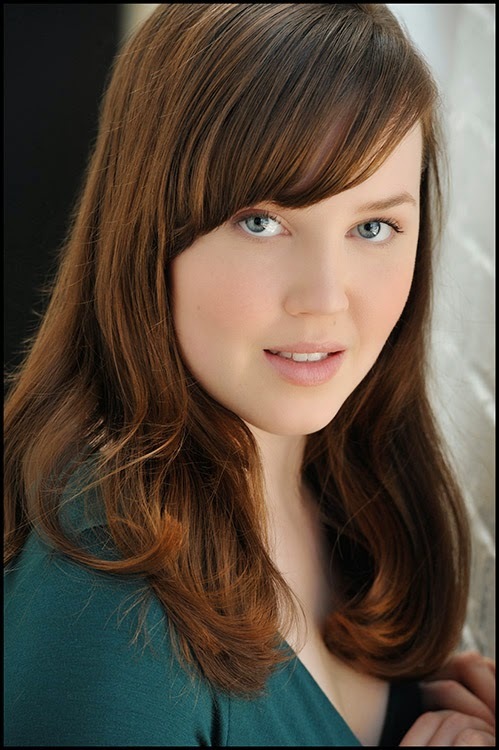 : I play Holly Phelps, a meek and achingly single young woman who has moved from small-town Ohio to the grand old city of Cleveland for a fresh start. She loves Jim Morrison, admires the poet Thomas Hardy, and when she’s not working as a secretary or part-time babysitter, she enjoys doing some writing of her own. In the course of the play, she happily attends a small party to watch the U.S. moon landing on television where she hopes to make some new friends, but finds herself in a precarious situation. Tell us about Live From the Surface of the Moon: Live From The Surface Of The Moon, written and directed by the brilliant Max Baker, takes place over the course of two epic nights in 1969 — the night Neil Armstrong became the first man to walk on the moon, and New Year’s Eve. The play is distinctly set in the late sixties, but the gender roles and dynamics between the six characters are dangerously relevant and comparable to our society today. Expect tears, laughter and ::spoiler alert:: pee. What is it like being a part of Live From the Surface of the Moon? : The process has been great because the ensemble has had the opportunity to develop the script and characters with Max since September, prior to our intensive rehearsal process leading up to the production at The Wild Project in April. Max guided us through some fantastic exercises (including a 60-minute improv in which he brought in some authentic 1960s board games!!! ), and many of the discoveries we made in this portion of the process have influenced the characters’ voices and the shape of the play. Max brings such a generous and collaborative spirit into every rehearsal and leaves so much room for the actors to explore. Now that the script has a pretty definitive shape and we’re gearing up for the production, the work we did in the developmental portion of the process has provided us with such a strong foundation to connect with these characters and each other. What kind of theater speaks to you? What or who inspires you as an artist? : Anything that takes risks and bends the rules of what is conventional, safe or expected. Elevator Repair Service. All the companies dedicated to producing new work by playwrights who are breaking conventions and taking risks. Mark Jackson (the theater-maker, not the basketball player, although I’m sure he’s great too). Any roles you’re dying to play? : Right now, I’d have to say Karla in Halley Feiffer’s A Funny Thing Happened On The Way To The Gynecologic Oncology Unit At Memorial Sloan-Kettering Cancer Center Of New York City is on the top of that list. What’s your favorite showtune? : I’m not a huge showtunes gal but when I was eight I really liked to sing-a-long to “Easy Street” from Annie. If you could work with anyone you’ve yet to work with, who would it be? : Mark Jackson. Sheila Callaghan. Halley Feiffer. There are too many more to list so I’ll stick with those three for now. Who would play you in a movie about yourself and what would it be called? : It would be a docudrama that incorporated all of my AOL instant messenger transcripts from my teenage years called “He Dumped Me On Aim”. My dear friend Collin McConell would play me. If you could go back in time and see any play or musical you missed, what would it be? : Rattlestick’s production of The Aliens by Annie Baker. What show have you recommended to your friends? : The Woodsman. What’s your biggest guilty pleasure? : Hot cheetos and potty humor. What’s up next? : A reading of Inappropriate Sexual Relations by Ken Urban.